Over one day the OSCE SMM has recorded the concentration of almost three hundred heavy units of militants, including those loaded and ready for combat clashes, which were located to the southwest from the occupied Luhansk. A relevant statement was made by the Principal Deputy Chief Monitor of the OSCE monitoring mission in Ukraine Alexander Hug at a briefing in the Ukraine crisis media center, QHA correspondent reports. Alexander Hug said that last week the OSCE SMM recorded 69 units of arms located in the vicinity of the contact line, with violations of the withdrawal lines - 14 in the government-controlled areas and 55 in areas beyond the control of the government. At the same time, he stressed that apart from these units, in the occupied part of the Donbas, a little farther from the contact line, a large number of other military equipment of militants was observed, moving uncontrollably through these areas. According to SMM, in the vicinity of the settlements of Mirne and Shimshinovka (located to the southwest from occupied Luhansk) a huge arsenal was spotted in full combat readiness. Alexander Hug demonstrated several photos taken from the SMM UAV on September 22 near Mirne, which is controlled by the so-called "LPR" and listed types of weapons. Hug stressed that this hardware is located beyond of certain storage areas and arbitrarily moves. 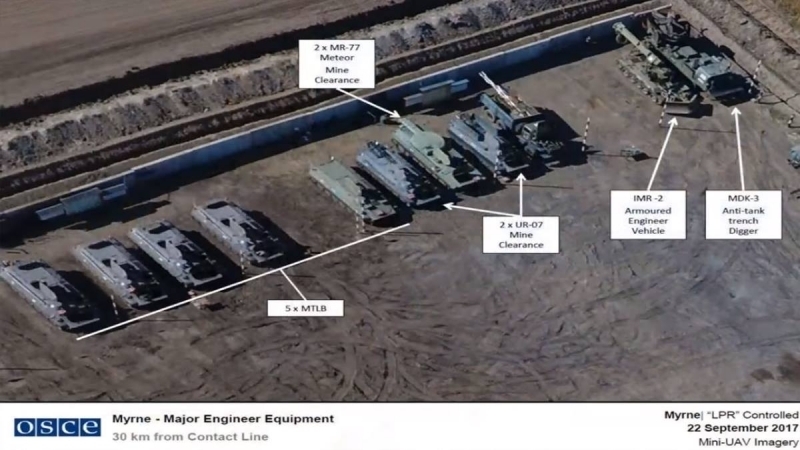 At the same time, most of the technology is loaded, which indicates its combat readiness (QHA: the SMM does not indicate the origin of the equipment, but the Ukrainian side believes that this is Russian armament moved across the uncontrolled Russian-Ukrainian border). Alexander Hug further reported that a large number of weapons systems of militants were found near Shimshinovka, which is controlled by the so-called "LPR" (not far from the already mentioned Mirne-Ed. ), based on satellite surveillance data: 19 tanks, 17 armored personnel carriers, one of which was mounted with an anti-aircraft gun, an anti-aircraft missile system, three self-propelled howitzers, three towed howitzers and other equipment in advance to combat formation. The Principal Deputy Chief Monitor of the OSCE monitoring mission once again noted that the presence of military equipment in the area of the contact line could provoke an escalation of hostilities. As an example, he recalled the outburst of combat activity, which occurred on September 23-24 in the Svetlodarsk area: out of 900 violations of the ceasefire regime, recorded in these days as a whole, over 90% occurred in Svetlodorsk. He said that earlier such aggravation in this area was recorded in the beginning of August. Speaking in general about the situation in the ATO zone, Alexander Hug noted that despite the parties' statements on compliance with the agreements, the number of violations of the ceasefire regime has increased by 25% since last week to 2,469 cases. He went on saying that, the number of civilian victims in the conflict zone has increased as well. Since the beginning of the year the SMM has confirmed 388 victims, among them 68 dead and 320 wounded. Hug separately noted that in August the number of victims among children has increased. In August, 19% of all victims were children, whereas last year this figure was 10%.